The City’s 2015-2019 Capital Plan for Public Schools: How Many New Seats & When Will They Be Ready? Under the recently adopted fiscal year 2015-2019 capital plan for schools, 62 percent of the 32,560 new seats will be completed within the five-year plan period, including projects that had been funded for design but not construction under the previous plan. Another 21 percent of the seats are expected to be completed in time for the 2020-2021 school year. 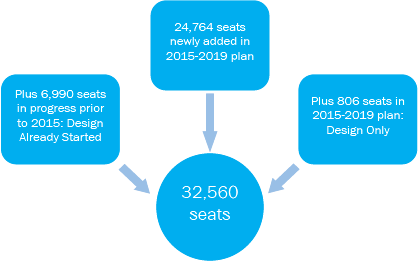 Including seats scheduled for completion after 2019-2020, design will begin for 79 percent of the new seats during the five-year plan period. Design for most of the other seats began during the preceding plan. An average of 5,907 seats is expected to be completed each year from 2017-2018 through 2021-2022; over 95 percent of the new seats will be available by the start of the 2021-2022 school year. The period from design to completion is typically expected to take from three to four years.